**Frida- ANNI-FRID LYNGSTAD 1971 Out of print Swedish LP. Harpo -" Moviestar" single .... 1975 Scandinavian & German single. Bjorn Skifs -Schiffz-Swedish LP 1975. Narrative-Frida's rare and unreleased recordings..
***Agnetha,Björn, Benny ,AnniFrid-PA SVENSKA 1994 Swedish Cd. ****Annifrid Lyngstad -Frida 1967-1972 2cd set Released 1997 Swedish CD. Frida Lyngstad from ABBA is not to be confused with the painter Frida Kahlo or that Frida from Peanuts. Frida's solo output is the smallest but perhaps, the most consistently good of the four members of ABBA. Frida has released just five studio albums. Her studio albums were released in 1971,1975,1982, 1984, and 1996. However,she has also released many songs not found on those albums. Unlike the three other members of ABBA Frida has not generally been able to write her own material (with the exception of handful of songs). However, the material she has sung has generally been of a high quality. Anni-Frid Lyngstad was born in Ballangen (near Narvik) Norway on November 15, 1945. She began her recording career in 1967, but had been singing professionally through most of the sixties.. 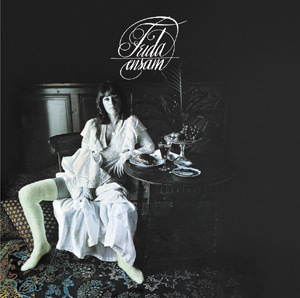 Most of her pre-ABBA recordings were light jazz/sophisticated pop music recordings sung in Swedish...During ABBA's heyday she made only one solo studio album the pop/rock Swedish language album-Frida Ensam. Between 1982 and 1985, Frida released two English language solo albums. By 1986, Frida gave up her full-time ,musical career to to mostly pursue other interests including doing environmental activism. Thus, in the past two decades Frida has made only one solo album-the excellent Djupa Andetag released in 1996. During the past twenty years Frida has on occasion recorded duets and some other one off -recordings. Most recently she recorded with Georg Wadenius. Frida has become beloved to her fans due to her elegance,vegetarianism, faith, humility, sense of humour, decency and ever changing hairstyles! Frida has been married three times ,but Lyngstad is her maiden name. Frida's third husband, Prince Rizzo Reuss, died on October 29, 1999. She currently spends much of her time in Switzerland. Frida's early recording career consisted entirely of seven single releases released only in Scandinavia all on the EMI Label. She released no LP's during the 1960's. All of this material has been made available on CD and much of it had been released on vinyl LP. Many of these songs were first compiled on Frida's second LP called Anni-Frid Lyngstad, and all were later compiled on the Frida 1967-1972 2CD set. This single was Frida's first recording session,. Various Artists-Melodiparad. 1, EMI , 1968 Swedish LP also listed as Various Artists-EMI-Sextetten , EMI Odeon PMES 575 , 1968 Swedish LP "
Early appearance on a LP for the Late 1968 single -"Mycket kär"/"När du blir min"
This was Frida's very first album, it came out after almost four years of the unsuccessful single releases listed above. Why she didn't lose her record contract we can only speculate on. For this album, Frida recorded 13 songs with Producer/boyfriend/future ABBA member, Benny Andersson between September 1970 and January 1971. The tracks were engineered by Björn Noren and featured arrangements by Bengt Palmers and Claes Rosendahl, Eleven of the songs appeared on this album. (the two other tracks were left unreleased). This is a restrained, tasteful album that ranges through jazz, folk, and pop that does not touch too heavily on rock and roll. The songs on this album are perhaps more suited for Frida than much what is found on Frida's first eight singles that preceded this album but the songs here also are less energetic than those singles. The lead off track "Tre Kvart Nu" sets the stage for the album-it's a tune by pianist Arthur Rubenstein set to Swedish lyrics by Benny's friend Peter Himmelstrand . "Tre Kvart Nu" translates to "Three Quarters (of a Hour) From Now". Frida does a good version of the title track from B&B's LYCKA album but actually I think the B&B version is a bit more emotional. Frida does a fine job with a Swedish version of Leonard Cohen's "Suzanne". We have here a rare chance to compare Agnetha and Frida's singing styles since both Frida and Agnetha did versions of " "Everything's All Right" and "I Don't Know How To Love Him" from Jesus Christ Superstar. Agnetha's versions were produced by Bjorn for the Swedish staging of Jesus Christ Superstar. Interestingly, Frida's versions use a different translation than that used on the Agnetha version. Not surprisingly, Agnetha's versions of these songs are better than Frida's versions, partly because Björn comes up with a more exciting arrangement for Aggie than Benny did producing for Frida, but partly because these songs are more suited more Aggie. All of the songs included here are sung in Swedish. Every Frida solo record up to 1982 would be sung in Swedish. All the later pressings of this album would include "Min Egan Stad" (My Home Town),which is a Swedish version of one of Benny's English language Hep Stars songs called originally " It's Nice To Be Back Again". Frida's version is bright, punctuated by Benny's piano and Agnetha, and Bjorn's backing vocals- it's bit of a preview of the ABBA sound. Recorded in July 71 it would be Frida's first big Swedish hit (it made it to #1 on the Svensktoppen, though not on the sales chart). The original version of this album has a relatively unattractive picture of Frida with her hair styled in a horrible short perm. The original album has a gatefold cover with some interesting pictures on the inner gatefold. A later different version of this album (the one I have) is called EMI Starseries Part Seven. It's in a ugly blue cover without the gatefold cover that graced the original.This album was never released on CD but all the tracks are available on the FRIDA 1967-1972 collection..
Frida recorded this song for a four song Swedish Disney song extended play disc.. This song is from Snow White. This track is very obscure and hard to get since it's not on any of Frida's albums.There are two other songs on this EP- a version of "Heigh Ho" sung by Rasmus , and two segments of "Theme to Snow white" performed by Kerston Franzen. Most sources say this album was released in 1971 though on one source, (ABBA-The Book by Potiez), it is implied that this album was released October 1972. Although this is a twelve song compilation none of the songs had been on a album before at the time this was released. Most sources say this album was released in 1971 though it seems more logical that it would have been released in 1972. This album draws mainly from Frida's eight singles released between 1967-1970 . Ten of the sixteen songs from her first eight singles made their album debut here. The remaining six sides wouldn't make it on a album till the 1990's. The 1971 "Min Egen Stad" /"En Gang Ar Ingen gang "single filled the eleventh and twelfth spots on this LP. Frida's first six singles were produced by EMI's Ollie Bergman. Ollie was the man who signed Frida to EMI after seeing her sing" En Ledig Dag" on the Hyland Horna TV show in September 1967. The oft-told story about that a special edition of this particular TV show was put on to keep people off the roads since Sweden was switching from driving on the left to driving on the right. "En Ledig Dag" (A Day Off) would also be her first single (released September 1967) and appears for the first time on album here. Eight of the songs here were produced by Ollie Bergman. Of the songs, produced by Ollie Bergman only "Härlig är vår jord" received any airplay. ( In all, Frida would have only five radio hits prior to 1974- "Härlig är vår jord", "Min egen stad , "En kväll om sommarn", Där du går lämnar kärleken spår" and "Man Vill Ju Leva Lite Dessemellan") "Härlig är vår jord" was notable also for being Frida entry in the 1969 Melodifestivalen. In 1969 Benny became Frida's producer (and her boyfriend!) Benny produced the remaining four songs found songs on this album. The "Min Egan Stad" single as well as two other songs "Peter Pan" and "Dar Du Gar Lamnar Karleken Spar" (Love Grows Where My Rosemary Goes").. "Peter Pan" was' a Swedish B&B composition recorded in Sept. 1969 . "Peter Pan" marked the first time that three future ABBA members worked on a record together. The cover of this album features Frida sitting down on a small hill showing off her legs (very similar to the cover of Agnetha's first album). This album was never released on Cd but all the songs are available on FRIDA 1967-1972. Frida's contract with EMI appears to have expired in 1972 ,which freed Frida to sign with Polar Records. However, by late 1972 ABBA was starting to take over Frida' career, and so Frida only released a few sides as a solo artist for Polar between 1972-1974. Polar's 1972 Christmas music album had tracks by Annifrid Lyngstad, Lena Anderson,Svenne Hudlund, trumpeter Arne Lambert, Sonja Stjernqvist and the Hootenanny Singers .The title of the album translates to "When Christmas Morning Is Shining".This album was produced by Stig, Benny and Bjorn.FRida sings two song on the album-. 'När det lider mot jul' ("When Christmas Time Is Approaching") and 'Gläns över sjö och strand' ("Shine Over Lake And Shore) . Apparently she got to pick which songs she would sing.The Hootz do versions of "Gå Sion, din Konung att möta" and "Nu Tandas Tusen Juleljus".". All of the tracks were recorded in 1972.
but this album was reissued in tandem with Agnetha and Linda's Christmas album on the 1994 Polar CD -JULENS MUSIK.The reissue ,JULENS MUSIK, is the closest thing we have to an ABBA Christmas album. (ABBA never recorded any Christmas music). This was released on EMI and it compiles Frida's 1971 Disney track, Nu Vissla I Ett Slag (Whistle While You Work). The song also appeared on a later Swedsih Disny compilation called Disney Marine . Frida did backing vocals for this song, which was recorded & released in both English & Swedish. The track has not been compiled on a Frida album, but is available on a recent Harpo collection. The recording of this song is pictured in the "From Waterloo to Mamma Mia" book.... This record was hit in Australia. Bjorn Skifs -Schiffz!, EMI Svenska AB, E 062-35220 -Swedish LP 1975.
executive producer. The only ABBA person who is missing is Agnetha.Aggie was otherwise occupied with her own solo album. The arrangements of the songs are as well thought out as the ABBA records of the period. This album catches Frida more confident and enthused then ever. The choice of material is quite varied. Most of the songs seem to be covers of previously released songs with the exception, of course, of the original Swedish version of "Fernando" which made it's debut here. (Frida's version was released slightly ahead of the English language ABBA version). "Fernando" is the only B&B song on the album. Two of the song choices were definitely not light jazz-"Liv Pa Mars'" (a spectacular swedish version of David Bowie's "Life On Mars") and a Swedish version of "Wall Street Shuffle" a 10CC song)." Life on Mars" was drawn from Bowie's HUNKY DORY album. Some of the other songs were more akin to her PRE-ABBA song selection but are given a much more effective presentation by the increasingly tight ABBA band. The front cover of this album featured Frida in a highly alluring but yet tasteful pose in a darkened room. Her hair is the medium long, dark straight hair of the Arrival era. This is one of the most successful Swedish market albums by a ABBA solo artist. It went to #1 in Sweden and sold over 100,000 copies. This album is a must have for Frida fans! Bosse calls up famous people and on this LP he called Frida and Stig. The first solo album after the divorces of Abba's two couples. It's appearance was a clue that ABBA was nearing the end of the road. Frida's first solo album in seven years. Frida chose Phil Collins. lead singer & drummer for Genesis to be produce this album. The album was recorded just right before Phil made it big with his No Jacket Required album. SOMETHING'S GOING ON came a year after Phil's first solo hit-"In the Air Tonight' was released. "In The Air Tonight " featured the influential drum sound that Phil had brought to the world partly through the talents of engineer Hugh Padgham. This distinctive drum sound was featured prominently in the title track here as well as on "Tell Me That's it Over" and elsewhere. The up tempo songs on this album tend to emphasize Frida's great radio voice instead of allowing Frida to be expressive. Giorgio Moredor/Pete Bellotte (Donna Summer's songwriters) was Frida's favorite song on the album. Frida , Phil's marriage had just broken up. The record closes with a cheesy duet between Phil and Frida. Phil and his record label, Atlantic didn't think the song was good enough to be a single and so when this was was released as a single it was without Phil singing. title track did well in the United States where it proved to be one of only 2 or three ABBA related records to make it onto MTV. (which at the time was something new and exciting). The video for "Something Going on' seemed to be surprisingly autobiographical since it's about a woman finding out that her lover has a new boyfriend. The album cover is a drawn portrait of Frida by Yves Poyet. The cover really, really jumps out at you. On the inside sleeve there was the photo on which the cover drawing was based showing Frida with sharply cut short dyed red hair. Two hard to get get Frida tracks come from this project. This was the first"musical" based on B&B music. The idea here was to borrow the melodies from ABBA songs and rewrite the lyrics so as be able to tell a story and also so as to be able to do it in French. Although the French version was not staged , a TV show and a Concept album were produced and released in 1983. (Produced by Alain Boublil of MISS SAIGON fame).It was French/Begian co-production. Frida was involved ,she played a Princess and sung a duet with Daniel Balavoine called "Belle.' which actually was a hit record in France.. Lyric Theater. This production was produced by Cameron McIntosh. The British version however, apparently did not result in another album , but at least two singles were released. ABBA considered but never recorded, The other single featured Elaine Paige doing a rewritten version of "My Love , My Life called "Like an Image Passing Me By. Oddly, the new lyricsfor this one cowritten by Björn. Apparently, B&B never saw the play-which seems bizarre considering how many times that they have sat through Mamma Mia. Frida also did backing vocals on a song for a related project Abbacadabra 2 . I don't have this album! Why don't I have this album you ask? Well, I saw this album in Germany many years ago, but I didn't have the money for it-so I didn't other getting it. I thought to myself-," I'll see that again" and I never did. Frida did backing vocals on the A-side of this single written and performed by Adam Ant-a new wavish British singer who was popular (we are not really sure why) during the 1980's. which songs they like on this album, none of the songs are universally loved. Anderson nixed these ideas and rushed her into completing this album. Frida listened to Stig because , of the four ABBA members, Frida was the most loyal to Stig. Frida did take Phil Collins's advice and for the first time she actually wrote songs, she completed a number of songs most of which were not made into finished recordings, among the unreleased songs written were "Light of love", " I`m one of God`s children" , "Can`t be serious" , " My dearest friend " and "I don`t wanna be alone" Two of the songs were actually released . "That's Tough" didn't make it on to the album . It was a non album B-side and actually includes a few lines sung in Swedish, "Don't Do It' was a lovely ballad that did actually make it on the album. many of the songs here . This was becoming a pattern on her 1980's work "-Me and I", "The Visitors", "You Owe Me One, "Something's Going On" all feature something other than her normal voice- the sound almost of a female computer. .In any case it's not always easy to be expressive when you have to sing like that much of the time but for the most part this weird voice is still fun to listen to. is it's closer. Frida counts in slowly to "Comfort Me' and takes her time coming to the last verses where she speaks the words. Lillywhite's carefully assembled sound environment is there but on " Comfort me" Frida, the human being is there too. for the Swedish market. It was to be nearly twelve years before she would make another album. This album seems cursed ...in January 1986 one of the albums' songwriters ,Daniel Balavoine, was killed in a helicopter crash. Sadly,in recent years two more songwriters on this album have died tragically. Kirsty MacColl died in a boating accident and Stuart Adamson commited suicide. Frida's duet with Ratata (" Sa lange Vi Har Haran")was originally released on this album. It was her only released recording between 1984 and 1992. Frida's rare and unreleased recordings..
All of Frida' 1960' and 1970's singles have been compiled on Compact Disc. Many of Frida's rare 1980's and 1990's songs have not been compiled on CD. Most of these are duets she has recorded with other acts .As such many of them can be found on albums by those acts. Some of the rare 1982-1994 singles tracks can only be found on those singles many of which were only released in Sweden. A few of these performances can be seen now on FRIDA -THE DVD 1967-2005. Frida is also noted for having done backing vocals on tracks by Harpo and Adam Ant. Frida has continued her almost annoying habit for making obscure duet recordings in the 2000's-with her recent work with German singer Dan Danille and opera singer Fillippa Giodano. This was the very first release on Cd of Frida's pre-ABBA solo material. This has 16 songs including three from Frida's 1971 studio album,six from her 1971 compilation album and seven 1967-1972 A and B sides that had never been released on a album before. for some unexpected listening experiences. largely by Frida's strong voice. least when she's singing in Swedish). The B&B composition "Vi Ar Alla Barn I Borjan' makes it's album debut here but is not one of their better songs.Although this is a fairly good compilation it is being phased out since all the tracks here are available on FRIDA 1967-1972.The cover features a lovely full color photo Frida with long unhindered straight but wavy red hair.As with many Frida albums, the color Pink is used on the cover-in this case a darker shade of pink.This was released by EMI . This environmentally conscious single had Frida singing along with Artister for Miljo: which was Frida , Marie Fredriksson of Roxette /opera singer Håkan Hagegård and onetime ABBA protege, Tomas Ledin.The A-side is a song written by Evert Taube. The b-side is the Julian Lennon environmental song-"Saltwater". Annoyingly this single is hard to find -and has not been compiled.This was the first Frida single to be made available on both CD and vinyl... The song was performed live on August 14, 1992 at Artister for Miljo gala . A few other songs were performed at the gala including a duet between Marrie Fredicksson and Frida on "What a Wonderful World"
Eight tracks (including the title track) come from the revised 1971 Frida album, four are drawn from the 1971 Frida compilation and one song makes it's album debut here -"Du Betonar Karlek Lite Fel'. Frida's hit" Min Egan Stad" puts in it's usual appearence here (it appears on five of Frida's albums) but otherwise none of the songs from "PA EGAN HAND are repeated here. All of the songs featured here are available on the FRIDA 1967-1972 2CD set. This album is a good place to get three rare Agnetha and Frida tracks and sample some of Swedish artists at the same time. Also included are Anders Glenmark, Roxette and former Hollies singer- Mikael Rickfors. Two Agnetha duets are included- Agnetha Fältskog & Tomas Ledin's "Never again", and , Agnetha Fältskog & Ola Håkansson"s "The way you are". One of Frida's duet's is included t he 1987 track ,, Så länge vi har varann, done as a duet with Ra ta ta. The Roxette track is called " From One Heart To Another." and EYES OF A WOMAN albums. This has seven songs by each of the girls. This features the first album appearance of Frida's 1984 B-side "That's Tough"
as well as the first album appearance of Agnetha's 1985 B-sides "Your There"
if you don't want to buy all four of these early Eighties solo albums. In a lot places this the only cd one can find by Agnetha or Frida. Agnetha,Björn, Benny ,AnniFrid-PA SVENSKA April 1994 Available on Swedish Cd. collection , five of the songs are Frida solo numbers from Frida's stint with the Polar label. This album is subtitled- Stikkan Anderson picks Polars Pearls. So in theory ,Stig made the track selections. This CD is one of the multi-disc Polar Pearls series. In the World ) . Why did Stig pick the worst song (The Most Beautiful Girl...)from the FRIDA ENSAM and put it on this CD -the only reason I can think of is that Stig wrote the lyrics and was after the publishing royalties. in tandem with Agnetha's 1980 Christmas album on a single Cd. and the Hootenanny Singers. The songs Frida did were "Nar Det Lider Mot" and "Glans Over Sjo Och Strand" . Frida's acapella duet version of "Dancing Queen " with THE REAL GROUP .It's very good, makes you wish she had done more work with them... The rest of the tracks are by The Real Group. The track can not be found on any Frida albums. The track was not released as a single at the time...This track also was performed live by The Real Group with Frida before the Queen of Sweden.... This track can albo be found on the Real Group's GET REAL album. 2. Varför får man inte bara vara som man är? many buyers of ABBA GOLD have this album. Djupa andetag was just done for the Swedish market. It came 12 years after SHINE. a great duet between Frida and Marie Frederickson (of Roxette) seems almost too gimmicky. Anders Glenmark (of Gemini fame) produced the album ,sang and played on it, wrote the music and most of the lyrics. His vocals touches (such as the Ay-Ay at the beginning of "ogonen' ) are surprisingly welcome,The keyboards are well-done they set the tone for most of the songs. As enjoyable as Anders Glenmark's work in English may be-it's obvious he's even better in Swedish. of Frida by Carl Bengstson is haunting. for Anderson Records by Lennart Ostlund. Various Artists - Svensk 70-tals Nostalgi Swedish CD Late 1990's? This compilation CD of Swedish pop music has a image of Frida on the cover as well three tracks by her -1970 track-Där Du Går Lämnar Kärleken Spår, 1971's Min Egen Stad, and the song "Moviestar" by Harpo that features Frida on backing vocals. Annifrid Lyngstad -Frida 1967-1972 2cd set Released October 1997 Available on Swedish CD. are here as well as all the non-album tracks from her PRE Polar label singles. Three tracks from Frida's singles were new to Cd for this album. "No Sad Song" almost sounds as it were a B&B song but it's not. However ,Benny did produce the record , Stig did the lyrical translation and track features Björn and Agnetha singing vocals and an accordion which sounds like Benny but it's somebody else. I borjan" (We ARE All Just Children In the Beginning) a song written by B&B. "Vi Ar..." was definitly a violation of Björn's normal rule of not having lyrics sound like a mouthful of misguided sounds. "Vi Har..." was the last of Frida's singles prior to signing to Polar Records. Five special bonus tracks are featured at the end of the second CD. These include four songs from a 1970 TV special featuring old Swedish standards such as "Att Alska I Varen Tid ". on guitar and is essentially a recording by Festfolk, the earliest version of ABBA. The only PRE- 1975 Frida tracks not to be found here are Frida's Disney recordings,her Christmas recordings, her 1972 Polar single "Man Vill Ju Leva Lite Desmellan" and unreleased material such as her Swedish version of "The Long and Winding Road. a English version of his notes can be accessed from Carl's web site. The booklet also features illustrations of the covers of her singles and dates for when each of the songs were recorded. This CD features 7 remixes taken from the CD singles of four songs originally available on DJUPA ANDETAG. This CD has lovely blue cover. Alternate remixes of "Alla mina bästa år" , "Ögonen " "Även en blomma " and " Alla mina bästa år" are included. Not essential, but cool to have if you love the Djupa antetag album. death of her daughter Liselott in a travel accident in America. most welcome but apparently Frida herself has vetoed such an idea. This version is out of print-and has been reissued with a new cover-see below. Fernando(Swedish version)/Shine/Vill Du Låna En Man/The Way You Do/Liv På Mars?/I Know There´s Something Going On /Aldrig Mej/Threnody/Ett Liv I Solen/Come To Me(I am Woman) /Skulle De Va Skönt/Tell Me It´s Over/Var Är Min Clown? WHAT'S FRIDA BEEN UP TO in the second millenium! profile partly because of the unfortunate death of her daughter Lise-lott in a travel accident in America and the death of her third husband,Prince Rizzo Reuss, on October 29, 1999. Reissue of the 1998 compilation CD this time with a new cover. "The old wine with a new wineskin" as Jesse Jackson would say. This A compilation of 14 tracks from her three albums Frida Ensam, Something's Going On, Shine) released in Sweden on the Polar label. Yet another one disc compilation of her 1967-1972 EMI-solo work. This Greatest Hits Collection includes Frida duet with the group RATATA on "Sa lange Vi Har Haran". The song was orignaally released in 1987. Frida made her first new released recording in six years here. The song is released merely as bonus recording on a obscure Japanese release-so Frida obviously is just trying to have fun, and not make too many waves. Annoyingly this means yet again, Frida's recordings are not easy to obtain. FRIDA/DAN DANIELL -I HAVE A DREAM Late 2003 Hard to find German fanclub single. This is limited edition benefit single , sales of which are are being organised through the German Fan Club /website known as ABBA Remember, It was later released as part of Dan Daniell full length CD ..
Well here is the full length album with Frida's duet with Dan Daniell. Jon Lord is keyboardist best known for his work with the British rock band Deep Purple, Jon had two stints with those guys... Jon befriended Frida in Switzerland, and one of the bonuses of their friendship was a track on this album that was sung by Frida!! " The song is called "The Sun Will Shine Again"" It's a beautful if perhaps unexciting performance....There are also vocals on one song by Sam Brown, and on another song by Miller Anderson. The song "In Bleak Midwinter by Frida and Jon Lord is only available on video. However, the DVD is of considerable interest, and has also been made available separately. The DVD is called FRIDA THE DVD 1967-2005. The DVD features an exclusive interview with Frida that was shot on July 22, 2005, in Zermatt, Switzerland with the Matterhorn in the background (must be nice). Frida chats chats, chats... about Agnetha, ABBA reunions, her career, Phil Collins , and her taste for small gummy bears . She also shows us clips from Swedish TV and most of the videos from her solo career.. Many of the videos are rare and have not been seen by most ABBA fans....Both the CD's and DVD omit her little 1992 mini-comeback -"Saltwater", "Anglamark", and the charity concert that featured "What a Wonderful World" with Marie Fredriksson . The clips from Lite Grand I örat video TV show are not from the original master tapes and thus are of poor quality. Frida's friend Dan Daniell is also interviewed. The complete "The Making of Something's Going On.and "Mit I Livet" specials are included. The DVD has subtitles in French, German, Spanish, English and Portuguese. and is coded for viewing in all regions and runs three hours and twenty minutes. Frida's DVD is easily the most rewarding and unexpected of the various 2005 ABBA reissues and collections. Sadly, the box and the separate are now out of print and hard to find cheaply. Have a gummy bear, they are yummy! Editor's note: the gummi-bear segment might not be included in your copy.